I live in the Southwest so it goes without saying that I enjoy a good Southwest pattern – also Indian Fry Bread and Red Chili, but that’s another conversation. 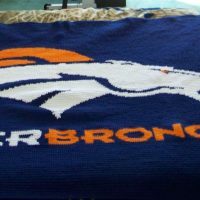 A few years ago I learned how to do tapestry crochet and I made several beautiful blankets for some friends. 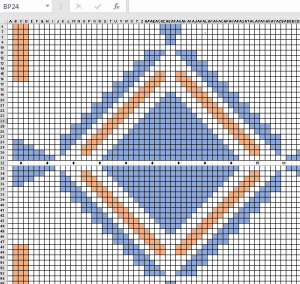 I wanted to take that technique and apply it to some great Southwest designs so I opened up my Excel and went to work. After I was able to engage my “right” brain, I was able to create a symmetrical geometric design that would be simple, but stunning and versatile depending on the colors of yarn I used. I have a large stash of partially used acrylic yarns, so it wasn’t going to be a problem to find some nicely contrasting colors. 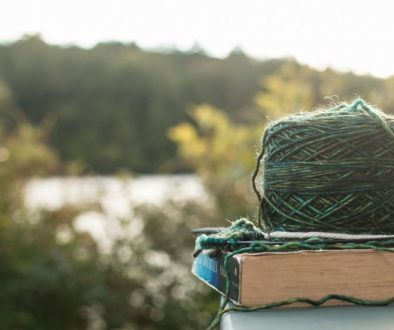 I started out by crocheting a small swatch, to check the gauge – it’s important to find a yarn and hook size that will create as close to a square as possible. I crocheted a small 10 stitch (single crochet) by 10 row swatch using size 4 acrylic yarn and size G/6-4.25mm hook. This gave me approximately 3″ wide by 2.8″ tall. Close enough. I know that a damp acrylic yarn will stretch slightly when you use steam to block it. Here we go. I wanted to create an 18″ x 18″ pillow, which means I needed 60 stitches wide by 60 rows. 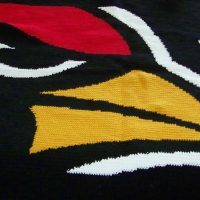 (Ten stitches = 3″ so 18″ divided by 3″ = 6 and 6 x 10 stitches = 60 stitches) I added an extra row/stitch on each end as a border for sewing together. I created the pattern where each block is a single crochet, showing color changes as different colored blocks. You don’t have to follow the colors specifically – be creative and use your imagination. I think any colors would look nice with this pattern. 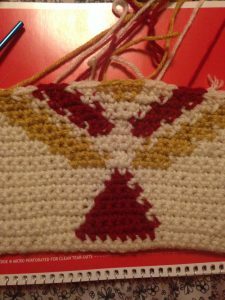 I used a modified form of this color change technique: Color Change by RedHeart – I do not carry my yarn underneath the stitches. I think it leaves a bumpy spot in the piece and you can see highly contrasting colors. I simply drop and leave the yarn at the change and pick it up on the next pass. You’ll have more ends to work in, but a cleaner look. I’ll put together a post explaining this, but you can use the RedHeart technique just fine. After the pieces are finished I tuck in my ends. 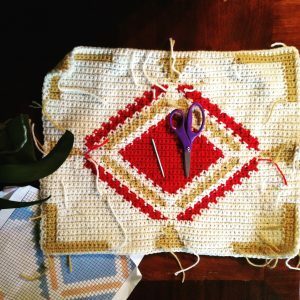 I never mix the colors when I tuck in the ends – sometimes that means you have to work horizontally and vertically to get everything tucked in. I don’t like my ends to pull free, so I give it three or four back and forth passes through the fabric before cutting them back. 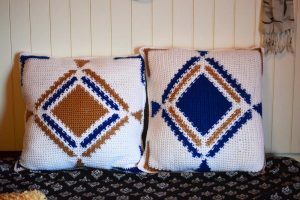 These pillows use all single crochet, but you can vary the stitch on the back side as long as your piece is the same size as the front so you can sew them together. I used a solid color back, but you could just repeat the pattern and have a double sided pillow. 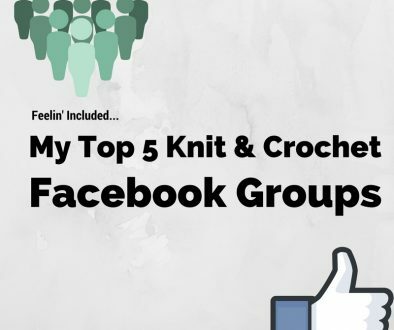 I use a simple single crochet to join the edges. 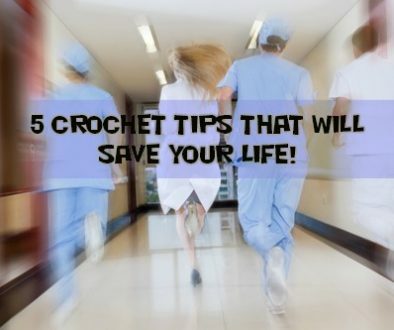 Just put your hook through the corresponding stitches on both the front and back pieces and make a single crochet. This makes a sturdy border that won’t pull apart and gives you a nice finish. I sew three sides together and then wash the pieces before adding the pillow inserts. This also helps in blocking. To block, after I’ve washed the pillow and squeezed out the excess water, I roll it up into a nice fat bath towel to get most of the water out. I then take the damp pillow case and lay it flat – I’ll pull it a bit to get it squared up. 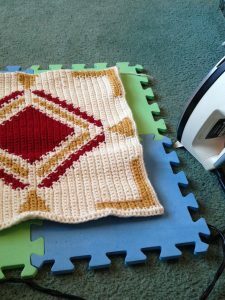 It helps to use a hot steam iron to get the yarn to stretch into place and once it cools down it will generally stay there. 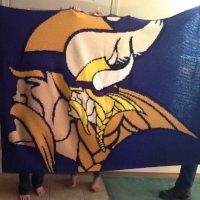 I use a simple tape measure and block it out to an 18″ x 18″ square (roughly). As soon as the case is completely cooled and dried, I plug in the insert. I used the Crafter’s Choice 18″x18″ insert that I got from my local big box store. After I have the insert in place and looking good, I finish off sewing up the final side and Voila! 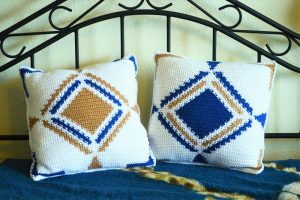 A beautiful Southwestern Design throw pillow to accent your home. I hope you enjoyed this post. Here is the pattern graph. I’d love to see the pillows you create with this pattern.